We're always on the hunt for the best dog products around, and we suddenly thought - what's the point in us knowing if we don't tell you? 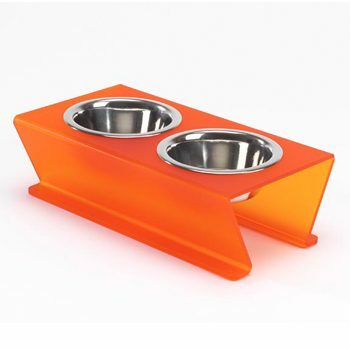 Continuing our series of the Best Dog Products, we've been hard at work finding the best dog dining products for you. Chloe and Mia have given their valuable feedback leaving us with the best selection of unique and fabulous designs and a little something different that offers your dog the chance to 'search and find' - we hope our selection has something just for you! Send us your pictures and videos of your dogs relaxing at home for our new K9 Stars section online at K9Magazine.com and email us your best dog product suggestions - we love to hear from you. So, without further delay, here's K9 Magazine's countdown of the best dog dining products! The Aïkiou Bowl from The Company of Animals – Provides a food hunting activity for your dog while they eat! Frost Orange Dining Tables from Scissal – Handcrafted, these luxury acrylic bowls are superb quality with dishwasher safe stainless steel bowls! Available in a variety of sizes and on-trend colour-ways. Black & White Dog Place Mat from Ancol Pet Products – Perfect for those messy pups! Available in a variety of colours and styles. Leopard print dog bowl with plush bone toy from Wuff in Style – Bring out the animal in you with this fun bowl ideal for small-medium size dogs!